Handmade from recycled oil drums in Haiti, this gecko is 8 inches long and painted with a colorful design. Available in many designs. This metal shorts magnet is handmade in Haiti from recycled steel oil drums. They measure 3 by 2.5 inches in size, each is hand painted.If you order more than one we will ship a variety of designs. 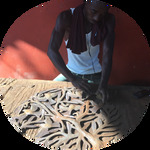 With a convex shape and protruding nose, this 10 inch diameter sun face crafted from recycled oil drums in Croix des Bouquets, Haiti is a unique piece of wall art.